The Ramanagaram C.M.C. is now concentrating on clearing the encroached footpaths in the town. 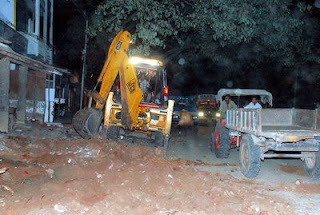 C.M.C president K.Seshadri (shashi) has taken serious note of footpath encroachments. Ramanagaram being a distric headquarters now, he wants the dignity of the district headquarters to prevail. To begin with the C.M.C. president himself lead a team of officers and workmen to clear the encroachments on the ever busy Magadi Road. People from all quarters of the society have lauded the efforts of the C.M.C.